One of the attractions of urban restoration to me is the way it breaks down the false dichotomy separating nature and the city. It forces us to connect with nature where we are, immediately. Nature is not something we drive to visit, not something remote photographed for the BBC or PBS, it’s right here. Ungainly, degraded perhaps, but still cracking through the cement, still living. Thierry Cohen photographs cities and their night sky in a very meticulous fashion. He photographs a city during the day; nine so far, all cities large enough that we can recognize them at a glance — Sao Paulo, Paris, New York, Hong Kong. He then eliminates all signs of human activity, as if we had vanished completely. He records the exact latitude of his position, the angle and direction of the camera, and then travels to a flat place free of light pollution at the exact same latitude. In the case of Hong Kong, that’s the Western Sahara, a distance of 7,800 miles. For New York City, it was the Black Rock Desert. He photographs the exact same night sky that would be visible over the city, even to the camera angle and direction. He then carefully superimposes that exact sky over the earlier photograph of the cityscape. I’d have no idea if he used the right sky or not, but his meticulousness pays off, particularly when looking at several images in a row or different shots of the same city. We know the variation in climate and location of the cities, these photographs show us the night sky varies over them as well. Sometimes drastically different skies in the same city, depending on where you’re looking. He even works in the shadows of the cityscape, a detail that if missing would hardly be noticed, but when added is stunning. There are several lessons I get from these photos. One is the distortions of maps and the world: I would never have guessed that New York and the Black Rock Desert, or Hong Kong and the Western Sahara, were the same latitude. Another is the awesome majesty of the night sky that we’re missing. I grew up in Chicago, and there was so much light pollution that at best you’d see a few stars; the moon itself, if old or new enough, disappeared in the haze. I was 18 before I saw my first deep sky unscreened by urban light. I thought, if we live on spaceship earth, let’s build a few space canoes. And, if we could see this where we lived, if everyone in the world could see the night sky, there would be no question of directing our energies to going there. A third lesson is that if humans did vanish magically, the world would abide. It would continue getting warmer for a while, but probably sooner than we think it would start healing itself and cooling off. I find that last reassuring. I also find the photographs very aesthetically appealing. The oily darkness of the cities, the only color coming from the sky itself. The detail in both sky and cityscape. I could become entranced by these photos, look at them for hours. 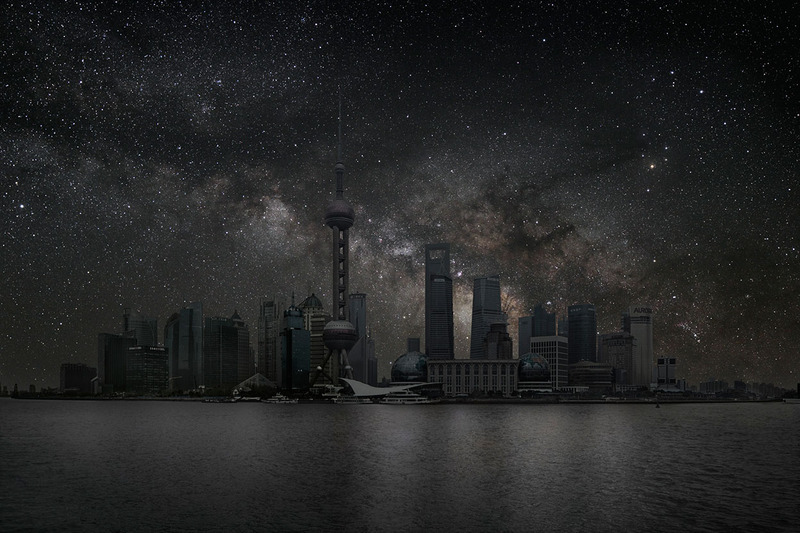 Cohen’s photographs show us what we’re missing with light pollution. They provide another way of breaking down the city/nature lie. They show us another connection to the universe.